It may be recalled that IMA had announced an initiative called Emotional Health & Emotional Well-Being of Medical Students and Doctors in India to address the problem ‘of increased rate of mental illness and suicides among young medicos’. It is organising a workshop at IMA House, Bengaluru on Sunday, 8th July, 2018 comprising presentations and orations by Isha Yoga Foundation, Banjara Academy, Laughter Yoga, and Art of Living Foundation. Subsequently Prof. Narendra Nayak, President of Federation of Indian Rationalists Associations (FIRA) had written an open letter to IMA questioning its scientific credentials for officially promoting unproven methodologies under its banner. Now the latest salvo against IMA comes from nine doctors including five from Mangalore, two from Bangalore and one each from Udupi and Ballary. Their media release is reproduced as follows. The signatories to the media release are: Dr B Srinivas Kakkilaya (Consultant Physician, Mangaluru), Dr KS Madhava Rao (Senior Neuropsychiatrist, Mangaluru), Dr. P Venkataraya Bhandary (Senior Neuropsychiatrist, Udupi), Dr Shashidhar Bilagi (Senior Neuropsychiatrist, Bengaluru), Dr Ravichandra Karkal (Consultant Neuropsychiatrist, Mangaluru), Dr Santosh Prabhu (Consultant Neuropsychiatrist, Mangaluru), Dr Yogananda Reddy (Consultant Paediatrician, Ballary), Dr Rakshit Kedambady (Consultant Neurologist, Mangaluru) and Dr Prakash C Rao (Senior Family Physician, Bengaluru). 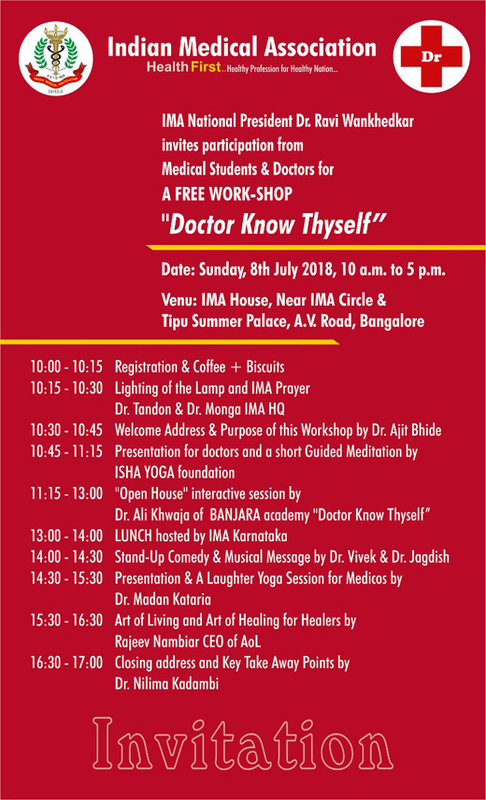 The Indian Medical Association (IMA) has started the IMA Initiative for Emotional Health & Emotional Well-Being of Medical Students and Doctors in India, supposedly considering the increased rate of mental illness and even suicides among young medicos, and is organising a workshop at IMA House, Bengaluru on Sunday, 8th July, 2018, comprising of presentations and orations by Isha Yoga Foundation, Banjara Academy, Laughter Yoga, and Art of Living Foundation. We, the undersigned practitioners and consultants of modern scientific medicine, and members of the IMA, are hereby opposing and dissociating ourselves from these programmes. The IMA represents the practitioners of evidence-based modern scientific medicine. It is appalling that the IMA is promoting unproven and unrelated methods such as yoga, meditation, laughter yoga etc., for the management of depression, anxiety, and suicidal thoughts, and thereby, is denying the well-proven methods in modern scientific medicine to treat and prevent stress, depression, anxiety etc. Severe depression and suicidal thoughts require urgent attention and treatment only from psychiatrists and no one else. A recent systematic review and meta-analysis have also conclusively shown the efficacy and acceptability of antidepressants in the treatment of depressive disorders. [The Lancet, 7 April 2018] The effectiveness of cognitive behavioural therapy in preventing suicides have also been proven. Several studies have been conducted on depression, anxiety, and stress among medical students and have comprehensively detailed the causes and relevant remedial measures. On the other hand, there is so far no conclusive evidence to support the use of yoga or meditation in the prevention or treatment of mental disorders, and these methods do not even find a mention in any of the evidence-based protocols for prevention or treatment of mental disorders or for the promotion of mental health. The National Mental Health Progamme and the National Mental Health Policy 2014 also do not mention yoga or meditation. It is pertinent to point out that Dr. Ajit Bhide, President, and Dr. Vinay Kumar, Hon. Secretary, Indian Psychiatric Society had questioned the action of the Ministry of Health and Family Welfare that released a poster on mental health on June 25th, advising people to go for walks, follow a routine, do yoga, eat fruits, etc., and they stated that depression is a serious matter that can have devastating effects and can lead to even suicide and needs medical attention and psychiatric help to tackle the illness. Further, in our country, seeking treatment from psychiatrists is considered a stigma, leading to delay or denial of treatment for many. Added to this, the lack of insight in many patients with severe mental illness also results in delays in seeking treatment. These being the realities, all efforts should be made to educate the masses to destigmatize psychiatric treatment and to encourage timely and scientific psychiatric care, as envisaged in the National Mental Health Programme. Promoting unproven methods such as yoga, quackery, faith healing and such other methods are likely to create further problems in strengthening mental health programmes in our country. Therefore, we urge the Indian Medical Association to stop the promotion of yoga and meditation for prevention and management of mental disorders, and instead to strengthen the evidence-based, modern scientific initiatives as envisaged by the WHO, National Mental Health Programme etc., for management of mental disorders and promotion of mental health.